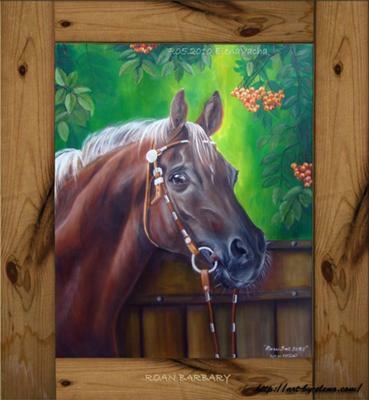 This painting is of a beautiful horse named Karakum. He lived in Vienna, and I fell in love with him as soon as I saw his picture. His owner gave me permission to paint him twice. This second painting was in remembrance of Karakum, as he died 1 year ago. So this is truly in loving memory of Karakum. This is the second painting. Absolutely beautiful and it must have been so healing to have been able to paint him! "Roan Barbary". Canvas. Oil. 24"x30"
Hello everyone! My name is Elena.I never received any formal art training, never even attending a class on artistic composition. I was anxious to learn and I studied in the evenings on the basics of painting, drawing, and composition from helpful sites I visited on the internet. To this day, I still study and I feel that achieving my goal of being a genuine artist will require that I continuously study all of my life. ROAN BARBARY: This is the name of King Richard II's favorite horse. "When Bolingbroke rode on Roan Barbary, That horse that thou so often hast bestrid." Shakespeare: Richard II., v. 5. Roan means "reddish-brown." Barbary means "foreign lands," from Latin barbarus, meaning "barbarous," possibly ultimately from Greek barbar, a word used to describe the sound of the unintelligible speech of foreigners. Comments for "Roan Barbary". Canvas. Oil. 24"x30"
Beautiful work! 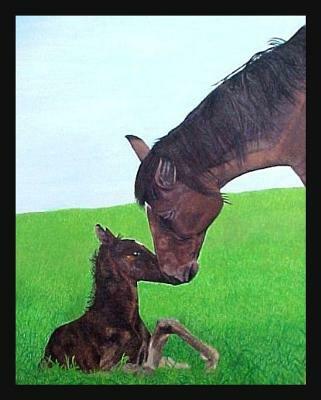 I love to paint horses and this is great! Being that I live in the desert and a lot if not all westerns are filmed in the desert, the green background seems a little weird to me with a horse. You have talent, and it shows... Nice work! I look forword to seeing more. Elena, I love the expression of the eye you have caught on this beautiful horse. It gives a real feeling of this animal. Good work. You are all very kind, and I greatly appreciate such nice compliments. Thank you, All, very much.